O Jesus, our Lord and Redeemer, through your passion and death, we adore and thank Thee. Holy Mary, Mother and Queen of Martyrs, Obtain for us sanctification through our sufferings. Holy Martyrs, followers of the suffering Christ, obtain for us the grace to imitate Him. St. Joseph Balikuddembe, first Martyr of Uganda, who inspired and encouraged Nephytes, obtain for us a spirit of truth and justice. St. Charles Lwanga, patron of the Youth and Catholic Action, obtain for us a firm and zealous faith. St. Matthias Mulumba, ideal Chief and follower of Christ meek and humble, obtain for us a Christian gentleness. St. Dionysius Sebuggwawo, zealous for the Christian Faith and renowned for your modesty, obtain for us the virture of modesty. St. Andrew Kaggwa, model Catechist and teacher, obtain for us a love of the teaching of Christ. St. Kizito, child resplendent in purity and Christian joy, obtain for us the gift of joy in our Lord. St. Gyaviira, shining example of how to forgive and forget injuries, obtain for us the grace to forgive those who injure us. St. Mukasa, fervent catechumen rewarded with the Baptism of your blood, obtain for us perseverance unto the death. St. Adolfus Ludigo, conspicuous by your following of our Lord's spirit of service to others; obtain for us a love of unselfish service. St. Anatoli Kiriggwajjo, humble servant preferring a devout life to wordly honours; obtain for us to love piety more than earthly things. St. Ambrosius Kibuuka, young man full of joy and love of your neighbour; obtain for us fraternal charity. St. Achilles Kiwanuka, who for the sake of Christ detested vain superstitious practices; obtain for us holy hatred of superstitious practices. St. John Muzeeyi, prudent councilor, renowned for the practice of works of mercy; obtain for us a love of those works of mercy. Blessed Jildo Irwa and Blessed Daudi Okello who gave up your lives for the spread of the Catholic Faith; obtain for us the zeal of spreading the Catholic Faith. St. Pontaianus Ngondwe, faithful soldier, longing for the martyr's crown; obtain for us the grace to be always faithful to our duty. St. Athanasius Bazzekuketta, faithful steward of the royal treasury; obtain for us a spirit of responsibility. St. Mbaaga, who preferred death to the persuasions of your parents; obtain for us to follow generously divine grace. St. Gonzaga Gonza, full of sympathy for prisoners, and all who were in trouble; obtain for us the spirit of mercy. St. Noe Mawaggali, humble worker and lover of evangelical poverty; obtain for us love of evangelical poverty. St. Luke Baanabakintu, who ardently desired to imitate the suffering Christ by Martyrdom; obtain for us a love of our motherland. St. Bruno Serunkuuma, soldier who gave an example of repentance and temperance; obtain for us the virture to repentance and temperance. St. Mugagga, young man renowned for your heroic chastity; obtain for us perserverance in chastity. Holy Martyrs, firm in your fidelity to the true Church of Christ; help us to be always faithful to the true Church of Christ. 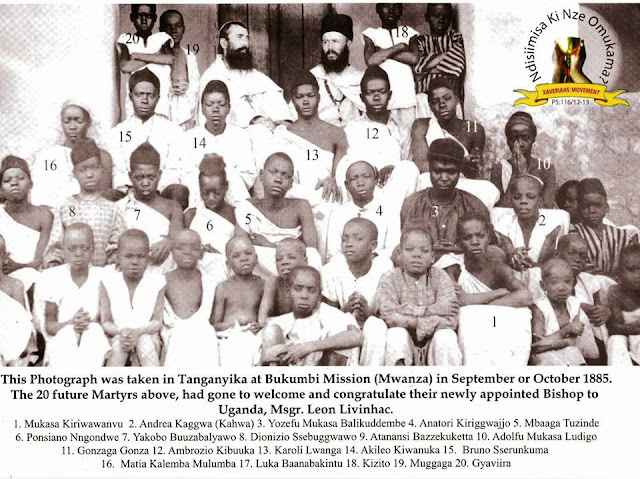 St. Charles Lwanga and the Martyrs of Uganda, we come to you asking your prayers of intercession on behalf of all who suffer from the unjust exercise of authority. May you who were so cruelly persecuted for your faith in Jesus Christ intercede for all who are oppressed, that they might be comforted by the Divine Mercy and empowered by the gift and grace of fortitude. May justice be the goal of all people and may all who are called by the name Christian join together in works of redemption directed at the sins and the structures of sin that afflict our communities. Amen.